I've been yearning to do a pastel series of birds I've seen, and keep trying to get lots of nice photos with my camera. But with the shutter-speed lag time, and the speed of birds, they always seem to fly off or move before I get that perfect pose. I may have to spring for a DSLR camera next to replace my trusty 3-year-old Kodak DX6490. 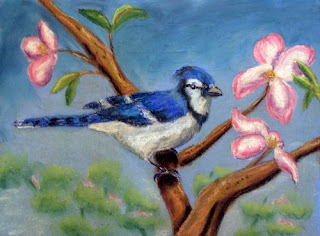 But I did love this sassy blue jay who came to visit my feeders over the winter and often perched in the dogwood tree. Of course it was not in bloom then, but it's blooming beautifully now, so I took some blossom photos and have had a try at combining things. I've been experimenting with pastel surfaces, and I'm not sure this one is a success. I usually use Canson paper as it's cheap and plentiful, but also flimsy - and I've been wanting something more sturdy. Of course sturdy also tends to mean "expensive". This was done on one of those canvas-on-cardboard supports readily available in art stores, and then coated with several coats of pastel primer. But it was awful to work with. I felt like a sidewalk artist, as if I was laying my pastel down on concrete - very rough and gritty. Several times I was ready to toss this out the window. I'm not sure it's a favorite but I'm glad I persevered, though the quests for the perfect support (sturdy AND cheap AND easy to work with) continues. I think this is the best animal representation yet. I think you really captured him better than even any of the in-house animals. I love the pastels. Great rendition of the blue jay.